Royal wall hangings can complete medieval party decor. A medieval party gives your guests the chance to feel like kings, queens, knights and courtiers for an evening. As you plan the decorations to go along with your medieval party theme, consider the ways you can use the party space's surfaces to turn the room into a banquet hall or a room in a royal castle. To give your guests the impression that they are walking into a throne room or a banqueting hall, use simple flag garlands. Make a dramatic, colorful statement without spending a great deal of money by making individual flags out of colored paper. Take tabloid-sized (11 by 17 inches) sheets of paper and cut an inverted triangle into the bottom edges to make banners; decorate each banner with a different medieval image or theme. You might use a family crest, the silhouette of a lion's head, a shield, a cross or a crown, or you can simply add a white outline near the edge for a textured look. 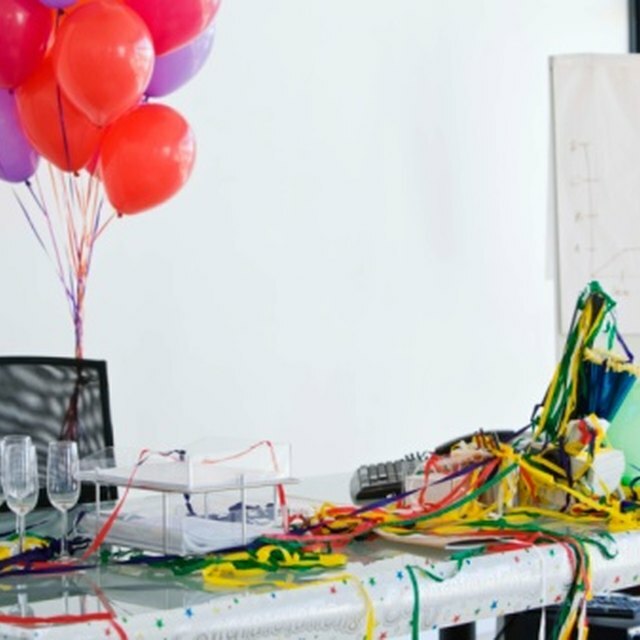 String the individual banners on rope or twine and drape the finished garlands in diagonal patterns across the room. 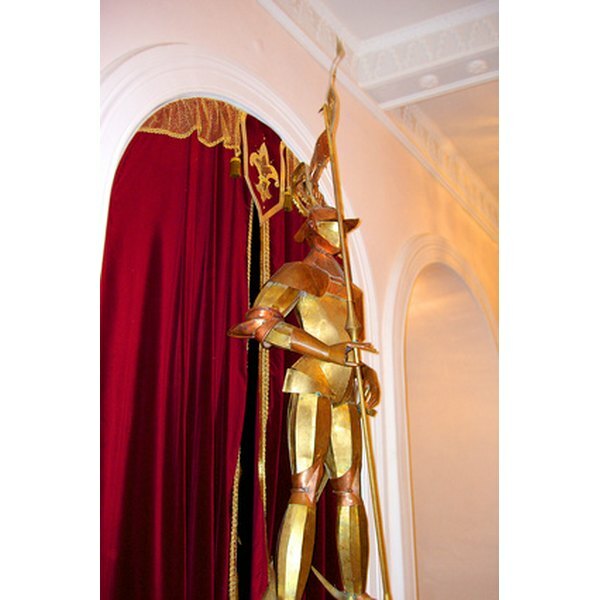 At the entrance to your party, create a walkway suitable for knights and ladies by using wooden dowels and paper flags. Make large triangles out of construction paper; on the shortest side, punch two holes in either corner. Put the dowel through the holes and push the other end into the ground. The paper flag should stand straight out from the pole. Line the walkway to the party with a multitude of colored flags for a festive entrance. Make the party space feel like a room in a castle by using rich, textured wall hangings. Buy long pieces of material in deep purple, green, blue, gold, maroon and silver colors; look for velvet, brocade, satin and metallic finishes. Cut long rectangles that are just shorter than the height of the room, and cut the bottom so the banner ends in a point. On top of the base, add layers of material, crests or medieval designs such as crowns or fleurs de lis. Fold the top edge over and sew to form a tube. Insert a wooden dowel and tie the ends of a piece of golden cord to each end to form a hanging device. Hang the banners around the room to create a rich, royal feeling. Make your guests feel like royalty by using over-the-top table settings. Place a banquet table at the head of the room for the feast, and fill it with decorative platters of food. Fill the spaces in between the platters with trailing vines, bunches of flowers or low jugs of wine. For a dramatic touch, use large candelabras filled with taper candles to add a medieval atmosphere. On individual tables, create centerpieces out of low vases of flowers and candles; for additional ambiance, set standing candelabras around the edges of the room.